Welcome to the Big Five Marathon media page. Click here to download a PDF of our 2017 Press Guide. This official press guide provides a detailed look at the history, concept and all events organized by Albatros Adventure Marathons. Current events include The Great Wall Marathon, The Big Five Marathon, The Petra Desert Marathon, The Polar Circle Marathon and The Bagan Temple Marathon. Click here to view a digital version and/or download our brochure. If you are a member of the press and would like to request press accreditation please contact Steen Albrechtsen, Press Manager, sa@albatros-travel.dk. If you need more information about the marathon, send an email to marathon@albatros-adventure.com. Please credit all photos with Albatros Adventure Marathons. Images can only be used for editorial purposes, unless permission has been granted by Albatros Adventure Marathons for other use. "On your mark: run the best marathons across the globe"
The marathon was a fantastic experience. The safari game drives and other activities such as mountain biking, bush walks etc. made it a great holiday. Also, it was very well organised. A belated and sincere "big five" thank you to all your team members for making the marathon trip to Entabeni Conservancy a truly memorable lifetime adventure for my daughter and me. Everyone we met was extraordinarily helpful, resourceful, and serviced our every needs. I am a non-runner since 2007 when my physician said those running days are over, but said I can walk as fast and long as I want. 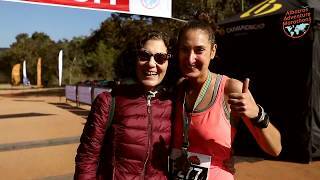 So it was so exciting to walk the half-marathon, to meet the many locals, participate with fellow marathoners from countries all around the earth, to be greeted by spectators, cared after by watchful Rangers and to safely walk a trail knowing/ seeing animals in their habitat. For those who enjoy a day at the zoo, well this is the best way to experience animals. What a killer hill! Loved it. What a beautiful day and welcoming finish line!!! What a party afterward!!! Loved the safari's and trusted knowledgeable guides. Thank you all so very much! Can't wait to do another trip. We truly enjoyed our time and will highly recommend your group to others as the best marathon sponsors worldwide.